Winter Dish dedicated to my father, who is best in cooking sweets, desserts like this. Keep heat on low flame. Keep on stirring the wheat flour until it turns golden brown. 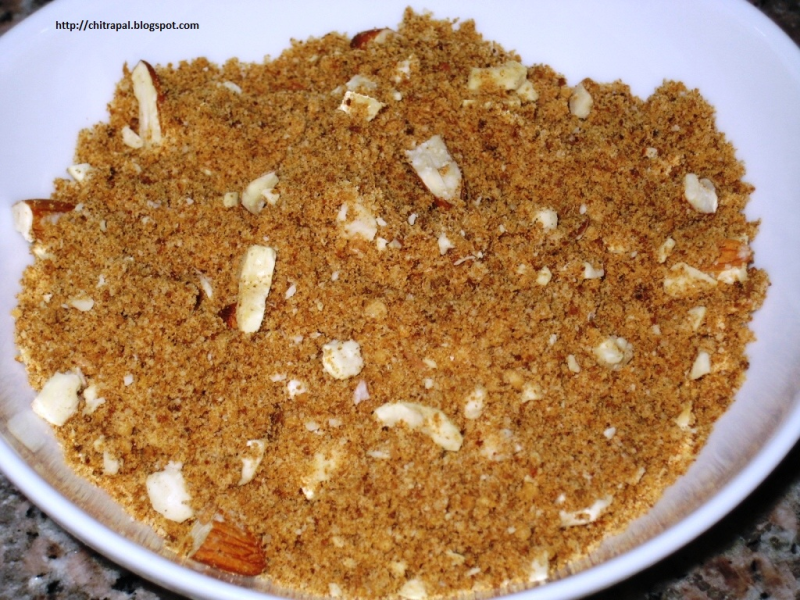 Add almonds and cashews to the mixture and stir it. Let the mixture cool down and serve. This dish is very nutritious for pregnant woman and kids but You can serve otherwise also with tea or coffee in cold winters. Thanks Rabz, yes my dad is very proud of me. I love your recipes would like to try some. Hi Chitra I have never tried panjiri with wheat flour I've always had it with Semolina and I love it and ate it even wen I am not pregnant,lol. I will try your method. your dad is lucky to have u I am sure.Thanks.